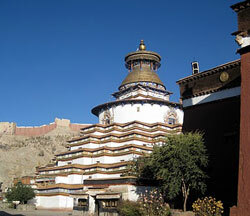 Classic tour covering the cultural centers of Tibet , namely Tsedang, Lhasa, Gyantse and Shigtse. Allows you to visit ancient monasteries, experience exotic culture and spectacular turquoise lakes. If your interest is to experience the Tibetan Buddhist culture, visit ancient monasteries and to get close to real people of Tibet , this is the right trip for you. This tour also offers other highlights of Tibet travel- the unique overland landscapes, the snow-covered mountains , serene lakes and dramatic high passes. Due to the same , this is one of the popular tour with us . The best time for this tour is April to early November . Day 1: Fly to Lhasa Gongkar airport and transfer to Tsedang (120KM.) Free to explore the town and acclimatize yourself. O/n in hotel in Tsedang . Day 2: Visit Yongbulakhong palace, Changdu monastery and the Tombs of the Tibetan Kings . O/n in hotel in Tsedang . Day 6: Visit Potala palace, Jokhang temple and Bharkhor traditional market . Day 7: Visit Drepung and Sera monastery. Day 8: End of Tibet culture tour . Transfer to the airport for onward flight. If you have a limited time, then we can omit Tsedang form the itinerary and follow this itinerary which is one day shorter . Day 1 Fly to Lhasa , transfer to hotel, free day to explore the local area and acclimatize yourself . 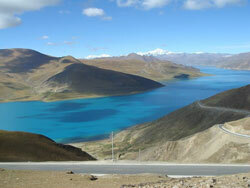 Day 4 Drive Lhasa to Gyantse via the Kambala pass and Yamdrok Tso lake ( 300 km ). Day 5 Visit Kumbum and Pelkor Chode Monastery at Gyantse. Drive Gyantse to Shigatse (100 km ) . 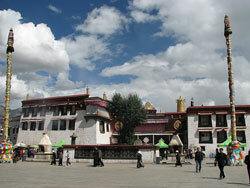 Visit Tashilhunpo monastery , the seat of the Panchen Lama. Day 6 Drive Shigatse to Lhasa via Yampachen, where you can enjoy the grassland view and hot spring. 270 km We do not trace back the route but we make a circuit while covering these places.This makes a very rewarding “Central Tibet Tour “. Day 7 Fly Lhasa onward .